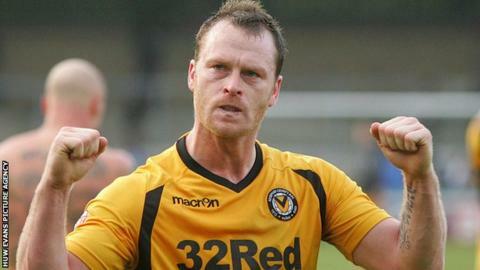 Newport County look set to retain midfielder Mike Flynn despite previously saying he would be released. The club have also confirmed they are in talks with Wales international defender Darcy Blake who has been on a short-term contract. County are still in talks with Byron Anthony, but have released David Pipe, Ryan Burge and Harry Worley. Newport finished 14th in League Two in the first season back in the Football League for 25 years. Flynn was told in February this year that the club would not be offering him a new contract. But a string of impressive displays at the end of the campaign have forced manager Justin Edinburgh into a change of heart. Former Cardiff defender Blake said recently that he would be considering an offer from the club. Retained players: Andrew Hughes, Adam Chapman, Aaron O'Connor, Robbie Wilmott, Shaun Jeffers, Ryan Jackson, Christian Jolley, Jamie Stephens, Joe Parker and Rene Howe. Offered contracts: Lenny Pidgeley, Max Porter, Ismail Yakubu, Lee Minshull, Chris Zebroski, Andy Sandell, Danny Crow. Released: David Pipe, Ryan Burge, Harry Worley.